The MC-80 line of star cruisers were the first large capital ships used by the Rebel Alliance. The first such ships deployed were the MC-80as, which were retrofitted luxury liners. These performed well as heavy cruisers and flagships and the Rebel Alliance decided to start producing them en-masse. Unfortunately, Rebel engineers did not have time to design a new ship from scratch, so they based their production design on the MC-80a. The result was the Mon Calamari MC-80b, which, while being the Rebel Alliance's first purpose-built heavy warship, was still a fundamentally civilian design. As the successor to the MC-80a, the MC-80b shares many of its strengths and weaknesses. MC-80bs are as easy to repair as MC-80as, since they are all built using the same engineering blueprint. However, MC-80bs are still difficult to repair due to their civilian ancestry and unique Mon Calamari design; that is, Mon Calamari engineers and ship-builders believe that every ship should be unique, so no two ships coming out of their shipyards are the same. 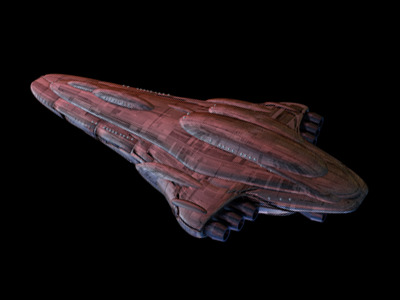 One thing many ship captains wanted was a redesign of the cruiser's hull. Civilian ships are designed to maximize internal volume, while military hulls are designed to withstand the rigours of space combat and minimize the damage done by hull breaches. Something common to both models is the use of monitors and control surfaces designed for Mon Calamari crew members, which makes them difficult for humanoid use. Another design priority was increasing the hyperspeed, to allow the heavy cruiser to keep up with the Rebel Alliance's lighter ships. Unfortunately, all designs have trade-offs, and shield strength and sublight speed were too low priority to see any of the extra power. The MC-80b does, however, have significant upgrades over the MC-80a. The 80b sports military-grade primary and secondary reactors. The increased power output allows the ship to operate significantly many more turbolaser, ion batteries and tractor beams. The intent of these upgrades is to give the MC-80b a fighting chance against its nemesis, the Imperial Star Destroyer. Although the upgrades narrowed the gap, the MC-80b doesn't quite match the ISD, given the star destroyer's greater shield and hull strength.